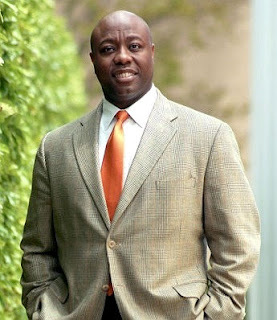 The appointment of Representative Tim Scott to fill Senator Jim DeMint's Senate seat is the best possible appointment for many reasons. While Scott does not have the most conservative voting record among our South Carolina Congressional delegation, he is a solid conservative whose vote will cancel out rogue Senator Lindsey Graham. He is also less likely than others on the "short list" to draw a primary opponent in 2014, forcing the strongest Senator-wannabe's to consider a primary challenge to Lindsey Graham. And best of all, Haley didn't appoint herself. Congratulations, Congressman Scott, we wish you great success and hope you will continue to "fight the good fight" so ably and nobly fought by Senator DeMint. South Carolina Gov. Nikki Haley on Monday named Rep. Tim Scott to replace the resigning Republican Sen. Jim DeMint. Mrs. Haley, who announced her decision at an early afternoon news conference at the state Capitol in Columbia, said Mr. Scott’s background as a entrepreneur will serve South Carolina well. “He earned this,” she said.